Cake Shop 3 is rated 3.8 out of 5 by 19. Rated 4 out of 5 by MsEnchanted2012 from Challenging, FUN, with VARIETY I liked this game, it was FUN, FAST, FRUSTRATING and definately challenging for me. I played the trial version and by the time I got to Italy I was a mess, making customers angry, getting walk outs, etc.. LOL!! 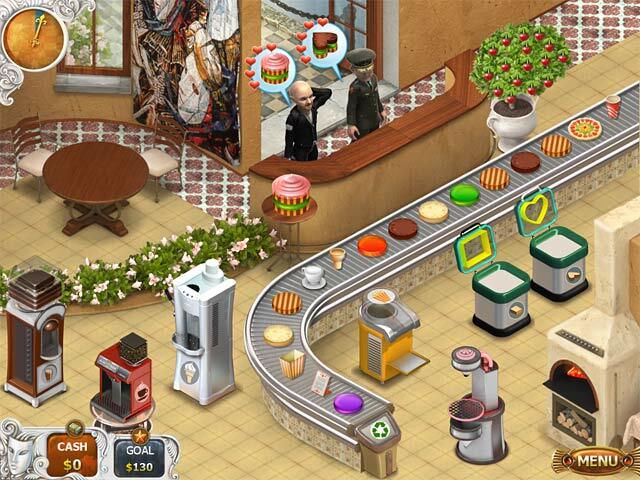 I liked it because the customers want more than just their order, you get to build a chain of cake shops and you get to renovate them as well, (which I thought was a nice touch added into this time management game). It's alot like burger shop 2, which was fun and intense but I really like the design layout on this better than the layout of burger shop2, both games are totally awesome and MUST HAVE's but it seems to me that this is more modern and the other is more robotic. I play time management restaurant games when I am up for an intense challenge and this game definately offers that. Although it is still very different from burger shop 2, so having both of them offers variety. For me, I think!! TRY IT OUT!! Rated 3 out of 5 by SilverBranch from A little mind numbing after a while A standard conveyor belt style TMG. Stacking layers of cakes, refillling consession machines and ovens and serving them all to awaiting customers. It's ok in maybe 20 minute intervals. But I find beyond 20 minutes, it's very repetitive to play and it becomes mind numbing and automatic to just click and click and click and click on matching foods without thinking much. I wouldn't buy it, but some people might like this. Rated 3 out of 5 by hugbear87 from Not Burger shop I played this game, because I thought it was like Burger shop. The game looks boring with general looking 3D characters and I did no t enjoy the gameplay, because I was expecting the same quality as Burger shop. There were many times when I missclicked, but I know I clicked the item. This makes the game not very nice to play. I wish there was possibility to click with right mouse button to quickly send items to customers. 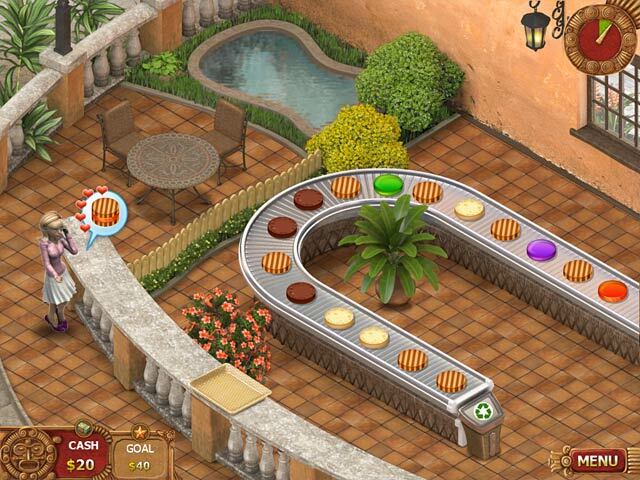 The game is good as Time management game, but it is not like Burger shop, so dont make same mistake as I did. Rated 3 out of 5 by jazzyjiz from Challenging game The game gets harder and harder as you move on and as you earn money you can construct and add equiptment in your cake shop as you please. Rated 3 out of 5 by beltie from Just Okay Although this one had the same good graphics and had more options for upgrades that weren't forced :), there were a few things I found that did not make it as enjoyable. Layout out machines didn't really make sense and couldn't tell when the day was ending from the "clock". At least on my machine, which has played the first 2 versions with no problem,the controls weren't as responsible as the previous games. Had to click sometimes 2 or 3 times to pick up or release an item. Having to seat customers was another tedious item. Again, probably due to the lack of sensitivity with the controls. Overall, I found it to be just okay. Hope another one more like te first two is on the horizon. Rated 3 out of 5 by alsteele28 from Hmm not too sure As other reviewers have said this is in the style of the 'burger' games, but again I am not too sure. I think it has something to do with the camera angles that kind of puts me of a tad, as I find them a bit disconcerting. You are not 'faced on' but more of a 'birds eye view' and for me for some reason this does not seem to work. I have played the hour and as with all TM games the story line is the 'same-old same old' but then not many of these 'cafe-style' TM games can really have much of a story-line I suppose as that is not the essence of the game. The sound and visuals are OK for this type of game and as DD game I maybe tempted. Rated 3 out of 5 by ChickieTeeta from Not as good as it could have been Although similar to burger shop in it's conveyor belt and machine style of play, I didn't enjoy cake shop 3 even half as much as the Burger Shop games. It should have been great, it has the same kind of gameplay, plus you upgrade buildings, but something feels lacking from it, for me anyway. 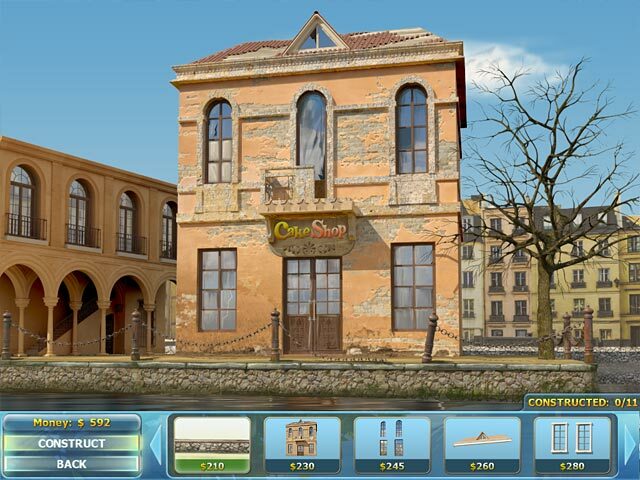 The characters are beautifully done for this type of game, and the buildings and scenery are nicely done as well. 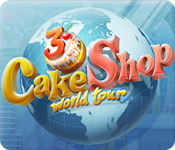 I gave it 3 for for visual quality, as the cakes (the point of the game) were poorly done, just badly textured shapes. I found it too easy also. It would probably be good for a day where you just want to relax and play something simple, but there are probably better relaxing games out there. I did want to like this, and am not quite sure what quality is missing from it, but something is definitely lacking. Also, if you try the demo, it's not just limited time, but limited level too, it only lets you play so far regardless of how much of your hour you have left. It's not a bad game, it's just ok. The best thing about it was the detail in the customer characters. Rated 2 out of 5 by Dominguez2000 from Boring Waste of Time I agree with the other reviewers who thought that this doesn't compare in the least to Burger Shop - and I shall add that it also isn't as fun as Cake Mania, Diner Dash, Parking Dash, Megaplex Mania, Youda Sushi Chef, etc. It's dull. Worst of all is that sometimes it didn't even give you the piece of cake that you needed. I noticed the same thing for Stand o' Food: at first it was pretty fun, but once I bought it and got up into the final levels, there was no way at all to win the game. Bummer. I like to win my $ back! :) In satisfaction, anyway.